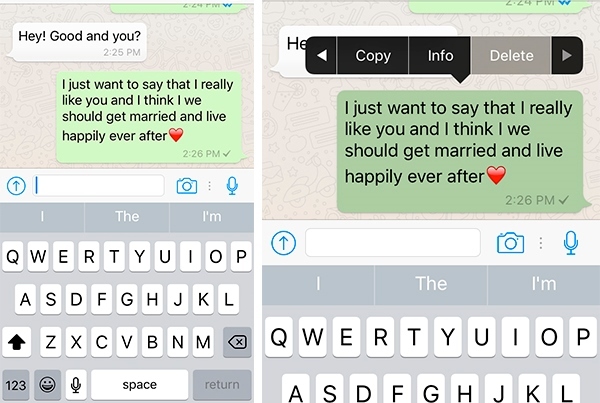 The WhatsApp released for all users the option to delete messages after sending. The function, initially arrived in the beta version of the application, but is already available for Androidsmartphones . After sending a message, the sender has up to seven minutes to delete it permanently, which prevents content from being saved in the chat and visible to contacts or members of a group. Remember that the action also works with photos and videos shared. However, this does not prevent contacts from reading the message before it is deleted. The tip below is ideal for people who have erroneously sent a message or who wish to keep confidential information about the chat. Check out how to delete messages on WhatsApp for Android. Step 1. In a chat, normally send a message to a contact. Step 2. Hold down the sent message until you open options at the top of the screen. At that point, click on delete button as shown in the above image. Step 3. Choose the option “Delete “. Note that instead of the message there is only one warning indicating that the message has been deleted. Use the hint to disappear with messages sent by mistake or to preserve personal matters shared with friends.